JUPITER, Fla. - Jupiter Medical Center recently bolstered its patient and staff safety measures with two Tru-D SmartUVC robots. "The Tru-D robots not only allow Jupiter Medical Center to adhere to its mission of providing world class health care, but also reinforces its standing as a leading health care organization in its region," said Chuck Dunn, president and CEO of Tru-D SmartUVC. Tru-D SmartUVC is the only UV disinfection system that delivers an automated, measured dose of UVC to consistently disinfect an entire room from a single position. The patented design ensures 99.99 percent pathogen reduction in direct and shadowed areas and eliminates human error as well as documents disinfection results for each cycle. The Tru-D robots were purchased thanks to the generosity of the Medical Center's Auxiliary. The hospital volunteer group wanted to provide a gift that would have a direct impact on patient care and safety. After thorough research of various automated UVC disinfection systems, the Medical Center chose to purchase Tru-D for its intuitive technology, smart data-tracking capability and proven efficacy in real-world settings. "Our Auxiliary is dedicated to assisting us in providing excellent care and had a desire to purchase technology that could do so. Jupiter Medical Center is known for providing world-class quality. We are consistently keeping a close eye on ways in which we can add to our infection prevention and quality outcome measures, and the Tru-D robots were great additions to our existing tools. We are grateful to our Auxiliary for sharing our commitment to quality, and providing us with this gift," said Steve Seeley, vice president, chief operating officer and chief nursing officer of Jupiter Medical Center. Tru-D has been validated by more than a dozen scientific third-party studies. 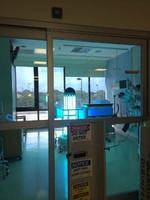 Most recently, results of the landmark Benefits of Enhanced Terminal Room Disinfection study, which was funded by the Centers for Disease Control and Prevention, prove that enhanced terminal room disinfection strategies decreased the cumulative incidence of multidrug-resistant organisms by 10 to 30 percent, and the largest decreases were seen when Tru-D was added to the standard cleaning strategy. For more information, visit Tru-D.com. Tru-D SmartUVC is the device of choice for nearly all of the existing independent research on UV disinfection technology. More than 300 Tru-Ds have been deployed to disinfect hospitals across the globe, including the National Institutes of Health Clinical Center in Bethesda, Maryland; Vancouver General Hospital in Vancouver, British Columbia; Nottingham University Hospitals NHS Trust's QMC campus in Nottingham, England; and Ebola Treatment Units at ELWA Hospital and Island Hospital in Monrovia, Liberia. For information and links to independent studies on Tru-D, visit Tru-D.com. Sodium Hypochlorite Generator has on-board water softener. Ozone Injection System provides water loop sanitization.